Wayward Pines is a new American mystery series directed by M. Night Shylaman based on the series of novels by the same name. It's the story of a US. Secret Service agent investigating the disappearance of several other agents in a small town in Idaho. Are you watching it, or do you want to? 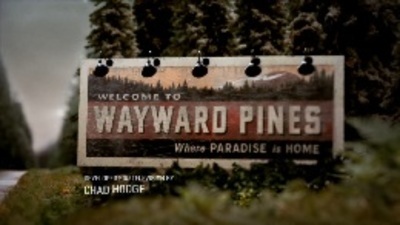 "Wayward Pines Intertitle" by Source. Licensed under Fair use via Wikipedia. I haven't seen it yet but it's high on my list of shows to watch, the books were excellent! When I saw the trailer I thought it was a US remake of The Prisoner because the plot sounds pretty similar, but it doesn't seem to be. I'll check it out. This is the first I have heard of it. Although I am generally not interested in crime dramas, this one sounds quite interesting. First I've heard of it as well, I'll definitely check it out. The photo looks reminiscent of Twin Peaks. Sounds interesting. I haven't read the books, and have only seen Signs. Probably on Cable TV, which I don't have!